December 2013 – He Said What?! Last night there was a whole lotta drama going on at our house. A whole lotta anger…..sighing…..tears……arguing…….slamming doors……..unplugging the baby monitor…….strong words from both parties. In other words, Aaron was facing the reality of entering back into the real world of going to his day group versus the fun of staying home. It’s the reality of meeting a schedule and being responsible instead of lounging around all day as he drifted between his room and his computer to the rest of the house and all the family that was present. I had dreaded last night and for good reason. I had made some preparatory remarks to Aaron over the past two days in order to get him ready for this upcoming reality. However, nothing really sank in until it was time to get off the computer, brush his teeth, and get ready for bed. Oh my, he was most unhappy. I tried to stay calm, made harder by the fact that I wasn’t feeling well at all. My body was telling me that I was getting sick even as Aaron was telling me that he had no intention of going to Paradigm the next day. I don’t know which was worse, but I was in no mood to be messed with on this night in which I had hoped to go to bed a little early. It’s very hard on any day to lay my own feelings aside as I try to deal with Aaron’s unreasonable attitude at times, but especially hard when I’m not feeling well. Somehow we both managed to make it to bed without too much damage done, although I did make some statement about everything he got for Christmas disappearing at some point. Did I really say that? Yes, I did. Aaron was somber as I heard him getting ready for bed. He met Gary at the head of the stairs, in tears, and Gary gently talked to him. I lay in bed listening, so thankful for that kindness that Aaron needed right then. I woke up during the night with my throat hurting, so I took the time……….several times………to pray for Aaron. I asked the Lord to give Aaron calmness in the morning, and good rest before then. And I asked the same for myself. Especially the calmness part. Did I really tell Aaron that all his Christmas gifts would disappear, I thought as I tried to sleep? I was nervous when I heard Aaron come down the stairs this morning. His eyes were so tired and I feared a repeat of the night before. Yet when I spoke to him, he answered with calmness……….that calmness for which I had prayed. I gained confidence then, and told him that I would pour his coffee and carry it upstairs while he showered………and he agreed. Then I ventured forward with my plan. “Aaron, I’ll get ready early and let’s go to Burger King for breakfast on our way to meet your group,” I said with a measure of fear that I kept hidden. My fear was that he would yell, “NO!” like he had done last night. But this morning he was compliant and he agreed to breakfast, even though it involved meeting his group afterwards. Aaron did very well all morning. He was especially happy that I took the time to watch the movie trailer for the next alien movie that he plans to watch. He stuffed some of his stocking treats in one of his pockets before we left the house and I did not object. He talked about aliens all the way to Burger King. He finally ordered his breakfast, and as we sat on the tall chairs that Aaron likes, he continued to talk about aliens. Finally, he remembered something else that he wanted to tell me. I have no idea why. It had to do with clipping my coupons and finding one that he didn’t know if I would use. And as we sat on our tall Burger King chairs, sipping coffee for Aaron and orange juice for me, I laughed and laughed at Aaron’s comment. He had no idea why I laughed or why I told him that he is so funny, and that I love to listen to him talk. He looked so pensive as he sat there, resigned to his fate of ending his vacation and going back to his day group, that my heart went out to him. And then he zinged me with one of his out-of-the-blue, hilarious comments, and I just had to laugh out loud. He was back to aliens as we drove the short distance from Burger King to meet his ride. He sighed heavily as he saw the familiar Paradigm van drive up beside us, and as he opened his door. He sure can look the most pitiful in these trying circumstances. But I know that he must get back to his life and to his routine, no matter how hard it is for him. And for me. I will not hide his Christmas gifts. I will hopefully hear a good report from him of his day back with his friends and his staff. I will try to be here for him tonight, even as we hopefully get to watch Wheel of Fortune again and I listen to him yell and clap. It’s part of life with Aaron and part of my responsibility to this special son that God has given us………even when I don’t feel up to it. And I did stop to thank God this morning for hearing my prayer, as He always does, and for letting Aaron be calm and happy this morning. I must not forget to thank Him for all that He does and for the grace that He gives this sometimes cranky, tired mama. Now what’s up with my hair? I wonder if I can find that coupon that Aaron said I needed. It’s been awhile since I just shared with you a typical time with Aaron when he returns home from his day group. Typical, but rarely routine. So let me tell you a little about Aaron this evening. He barreled in the door from the garage just as I was starting to fix supper, and he wasted no time in telling me about his day. “Mom! Today we went to the mall!” He had already called me from Paradigm and told me this, but to Aaron anything that he says is worth repeating……..many times. Pause for effect, and for me to ask what he saw. I’m not sure how Aaron thought I would know that since I was nowhere near the Santa in the mall today, but I didn’t try to explain that. I just told him that it was probably a rattle and Aaron was satisfied. That pretty well left adults or toddlers, so I chose toddlers and Aaron thought that was the right answer. Now he was done with Santa and he moved on to food. I never got a clear picture from him about exactly what he ate and how much it cost and whether he gave any of his money away. He was busily talking about his observations of the Chinese restaurant in the food court. Everything from the person handing out little samples on the end of a toothpick to the people working there was worthy of his discussion………over and over. One day he came home from the mall with this proclamation: “Mom, Chinese people love fish food!” And he has never wanted to eat there, although the egg rolls sometimes entice him. Today was no different as he verbally explored the Chinese restaurant. “I don’t want to eat Chinese food,” he declared. “I’m not Korean or Japanese or Chinese!” No amount of persuasion about not needing to be Korean or Japanese or Chinese could change his mind, either. He just kept talking right over my laughter, and only later did he ask if pizza is Mexican, and I reminded him about the Italian connection, and then he remembered and decided that the workers were probably American. And isn’t it much more fun to put it that way than to say that he’s heard that version of Jingle Bells? Of course it is! Now he tells me he loves me at bedtime sometimes, but a spontaneous comment like this is rare. I looked up at him quickly and his eyes were wide, like he was surprised himself at his outburst of affection. And to top it off, he came over to me and gave me a big hug. A big, genuine hug!! “I love you, too, Aaron,” I said as I patted him on the back. And just as quickly as the moment happened, it was over. But not forgotten, by me! Just like Aaron remembers every detail of his day, I’ll remember that “I love you” and that hug for a long time. He didn’t even need to shake a rattle to make me smile tonight. This past Saturday, I decided to make some Christmas cookies. I knew right away the ones that I wanted to make as I pulled out my recipes. There it was……Mary’s Sugar Cookies……….a family favorite for many, many years. I was trying to remember where the recipe had come from. I knew that Mom had gotten it from a friend when we kids were little. I still use the original recipe that I copied from her file before Gary and I got married. But there is no record about where Mom got the recipe. Was it from Rose Stepp, who used to give Mom and us four girls perms at her house? Or was it from Mary Underwood, another good family friend of Mom’s when we were growing up? As I was getting everything ready to make the cookies, a thought crossed my mind. A very natural thought…….one that I have thought hundreds and hundreds of times over the years. “I’ll just ask Mom where she got the recipe,” I thought. But just as quickly as that thought occurred, I had a second thought……..a very sad realization. I can’t ask Mom where the recipe came from because she won’t remember. And if she did give me a name I would honestly not know if she was correct. It seems like a small thing – the fact that she most likely wouldn’t even remember Mary’s Sugar Cookies, much less where they came from. But this inability to solve my cookie question is only the tip of the iceberg for Mom. Her Alzheimer’s has taken such a toll on her memory now that it’s really shocking to talk to John and Jan about how she’s doing. It’s also very telling to talk to Mom on the phone, and to realize that she doesn’t know who I am…….and even when I say that I’m Patty as we first start talking, I know right away that she probably doesn’t even know that Patty is her daughter. It’s been totally surprising, too, to hear about how she doesn’t know John. He and I talked yesterday, and the things he told me were so sad. We thought that she would remember John for a lot longer. He’s her only son, and he’s also her pastor. But she is always surprised that the man in the pulpit is her son, and she talks about how she had no idea that John the pastor is John her son. Perhaps most stunning of all, though, is that she doesn’t seem to recognize Dad as she looks at pictures of him. Mom will point to pictures of her and Dad, and then refer to him as her father. She did recently, with John, point to her wedding picture and refer to Dad as her husband……but not as Jack. She rarely if ever talks about him anymore. We just shake our heads in disbelief. I’ve never known another couple as devoted to each other as Mom and Dad were. They were inseparable during their retirement years. But now this awful Alzheimer’s has taken him out of her mind, it seems. Maybe, though, in some ways that lack of memory is a blessing for Mom. Tomorrow marks five years since Dad went to heaven. I was with them the month before he died. I saw Mom’s total commitment to him as he declined. There was nothing she wouldn’t do to make his days more tolerable. At night he would lie in his hospital bed and she would be lying in their bed beside him with her hand through the rails, holding his feeble hand as they fell asleep. She cleaned him and nursed him as best she could and made sure he was warm and comfortable and happy. She was getting very confused at that point, and Dad knew it. He was so worried about her, but we assured him that she would be fine. I think he needed to know that before he was ready to leave. Nearly every night during that month, Mom and I would ask Dad what he wanted to eat for supper. She and I cooked a main meal for lunch, so supper was lighter. And nearly every night he would think for a few seconds, then smile his incredible sweet smile, and softly and slowly tell us that he wanted scrambled eggs. But he wanted Mom’s scrambled eggs, made by her hands. I have the plastic cooking fork that she used for those eggs. 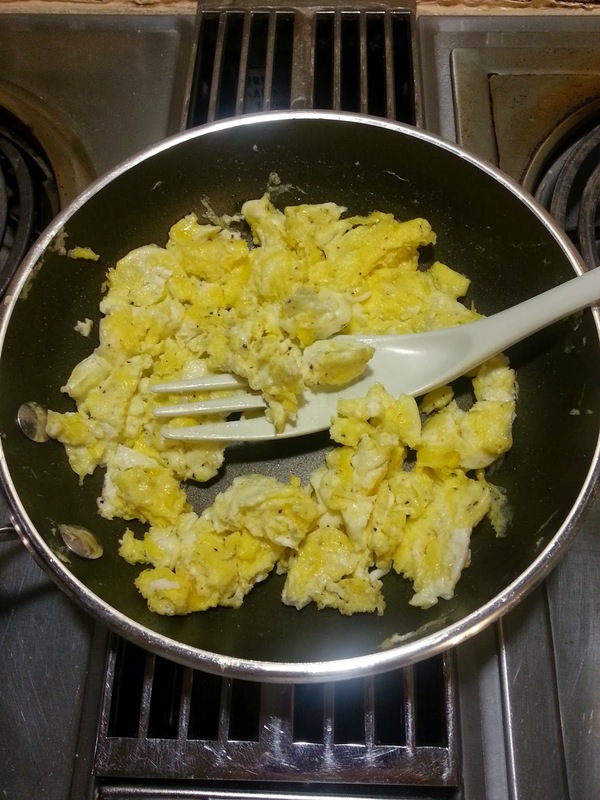 The thoughts of those nights, watching Dad slowly and contentedly eat Mom’s scrambled eggs, washed over me the other day when I scrambled some eggs…….and knew they were not nearly as good as Mom’s. Or as Mom’s used to be, for I doubt that now she could scramble an egg at all. It’s truly a blessing that Dad isn’t here to see her like this. We kids don’t know if he could have survived the sadness. He was so dependent on her, and so we see God’s mercy in taking him on first. Just like we can also see God’s mercy in the fact that Mom isn’t grieving his death or missing him daily like she used to do. But we’ll remember him for her, especially tomorrow. And we’ll remember their love for each other, for each of us kids, and for the Lord. We have so much for which to be thankful that even through some tears we can smile and even laugh at the memories. Christmas was their favorite time of year, so now in some ways it’s bittersweet. Yet Dad is so very happy in heaven, and Mom will one day join him there. We have hope through it all. Hope! That’s a wonderful word that carries wonderful promise. 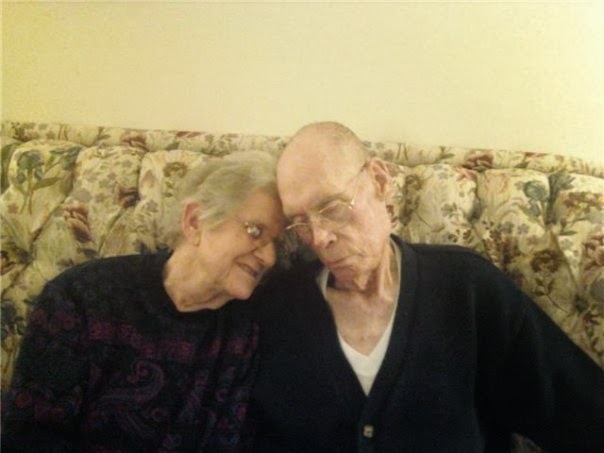 Dad’s death wasn’t the end and Mom’s Alzheimer’s is not the end. We have eternity to anticipate, where nothing will ever be forgotten again. I can find out where that cookie recipe came from, too. I had a sweet and telling conversation with Aaron this morning. Gary and I aren’t getting out today because there is a layer of ice on everything, and neither of us wants to fall. Therefore, I was enjoying another cup of coffee while Aaron clipped coupons……..and talked, of course. He was thinking of The Sound of Music because I watched it on television the other night. He didn’t want to join me in watching it but he knows the story on which it’s based. He watched the DVD with Julie Andrews as Maria several times in the past. As he was working away on the coupons, he asked me again to affirm the fact that The Sound of Music is based on a true story. Then, for some reason, he jumped to Pollyanna. “But Pollyanna is not a true story?” he asked. I told him that I didn’t think it was based on a true event, but that it taught us a good lesson regardless. He agreed, so I asked him what the lesson was that Pollyanna taught us. “It teaches us about happy,” Aaron answered. I agreed, and then talked about how even when things didn’t go well with Pollyanna, she still looked on the bright side and was positive. I told him that we could all learn a lesson from Pollyanna. “Yeah!” he said. “Like with that computer thing at Paradigm.” The other day he had an issue with another client regarding the computer – not Aaron’s fault – and so the next day Aaron didn’t want to go to Paradigm. I talked him through it and he went, but the incident is still fresh on his mind. I was so glad to see him making this connection! I reminded him of what I so often tell him: to set aside what happened and to move forward. I tried to get him to fill in the blank and he said, “To move ahead.” That works! Well, kind of, Aaron. Smile. He talked about how she was in “that chair” because she couldn’t walk and how she wasn’t happy anymore. And then I asked him what happened, and he said that her friends came and reminded her to be happy. “Just like I do with you!” I reaffirmed. A short while later, after I peeled him some mandarin oranges to eat, he wanted me to sit nearby while he finished the coupons. “You sit there and I’ll talk,” he told me. I laughed. Oh, yes, you’ll talk for sure, Aaron. Of that I have no doubt. And thankfully, I had the time to sit there for those few minutes………watching Aaron work and listening to him talk about this and about that. Watching him clip coupons is to see autism in motion. He works hard to clip each coupon ON the dotted line. He takes the little strips of paper that are left over and meticulously cuts them into small pieces, and watches as those pieces fall into his special trash can full of thousands of those colorful cut papers. 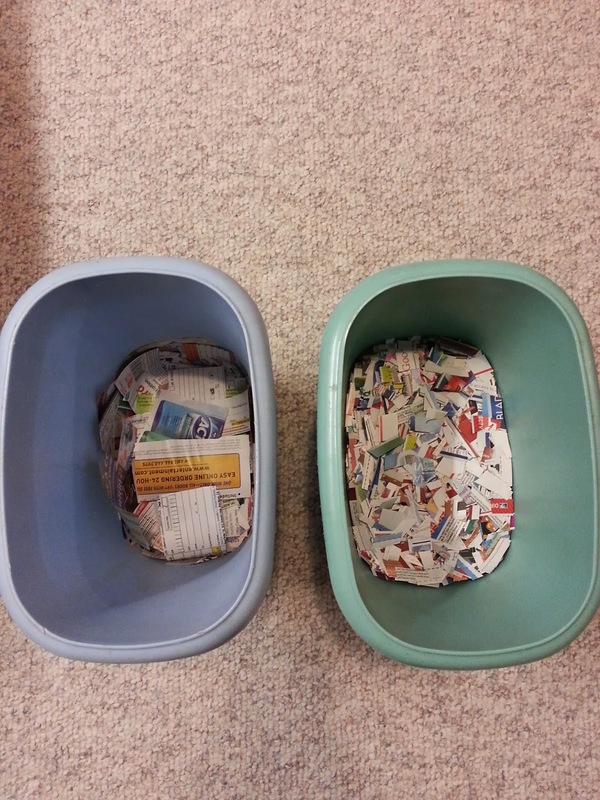 In another trash can, he places larger cut pieces that he knows I don’t want. 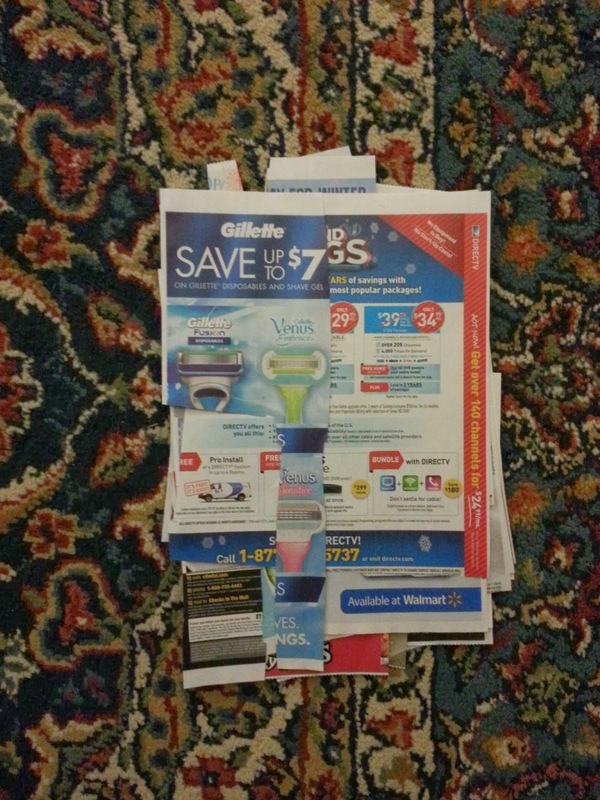 And then to the side, he carefully stacks the remnants of each coupon sheet that he has cut. It’s quite a process, and one that he thinks I fail at miserably……which is why he gets very upset if he finds out that I have some extra coupons that I set aside to cut myself. As I watched him work and listened to him talk, I thought about how unique and amazing he truly is. Would I like Aaron to “get fixed” like he said Pollyanna was? Well, certainly I would like for the seizures to go away and for his autism to not hold him captive in many areas. Yet I also know that Aaron is the person that God created him to be. We work to help him be the best that he can be, but I don’t want to have the attitude that he must be “fixed.” Instead, I hope to set aside any disappointments that I may have about Aaron and his life, and to move forward every single day. Move forward to understand him……to accept him……to instruct and teach him…….to continually reinforce positive traits and actions. But not to try to “fix” him……..because Aaron isn’t broken. Aaron is fully who he is, as all of us are, and I love that about him. Even through tears and fears and frustrations, Gary and I both love and treasure good old Aaron. I have also discovered that the person who needs to “get fixed” is me. Aaron has shown me so much about myself……….about my weaknesses and about how I need to be refined into what God wants for me. God is using Aaron to fix my broken self in so many areas. The coupons are done…….the oranges are eaten………and Aaron stretched out on the floor and laughed loudly as I sang “Do Re Mi” to him. It’s another day with Aaron. A day to be reminded to be happy, as Aaron so often does Even when he’s unaware of it, he is showing me a lot about moving forward and being happy. I don’t ever want a fix for that! 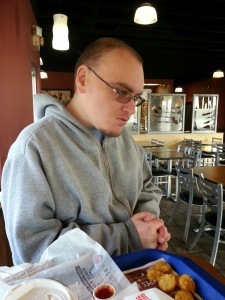 Author hesaidwhatksPosted on December 8, 2013 February 28, 2016 Categories Adult Autism, Asperger's Syndrome, EpilepsyLeave a comment on A Fix For Aaron? I Won’t Talk About It! Aaron was out of bed and happy this past Saturday morning, which he is on most mornings anymore. A happy Aaron is always a nice thing for us. He was enjoying this Thanksgiving break full of food and visits from friends and having Andrew home and no commitments. As Aaron and I talked on this morning, and I casually drank my coffee, he finally got around to what was really on his mind. It was his keyboard and when I was going to plug it in for him, which was no surprise to me at all. He knows, though, that I don’t want him going on and on about it. Yet he always thinks that I just might need a little reminder. Mom could be forgetful, he reasons, and so he feels that he must help me in this area. He stood by the table in his pajamas, fidgeting, as I waited for what I knew was coming. However, on this morning he tried a different tack. “Mom,” he said, “I’m not gonna say anything about you putting in my keyboard.” And he stood there just watching me. I chuckled, and he was clueless. “OK, Aaron,” I replied. I went on with my coffee and with reading the newspaper…….and he continued standing there, silently looking at me. “So I won’t say anything about the keyboard,” he repeated. “That’s fine, Aaron,” I again replied. I acted as if this conversation was just as usual an any other, but I so wanted to burst out with laughter. He finally walked over to pour some water and take his pills. Soon he was once again hovering around the table, and his thoughts were as clear to me as if they were written on his forehead. I just waited for it. “That’s great, Aaron!” I said. And he walked away a little disappointed, I think, that I didn’t mention the keyboard. If Mom would only say something about it, then he would feel free to be out with it! Too bad! When he was back downstairs, his arms full of his laundry, he stared at me as he walked past the table. He put his clothes in the laundry bin and then there he stood again, looking at me as I pretended not to notice. “I won’t talk about my keyboard,” he resumed. “All right, Aaron,” I acknowledged. I know he felt like time was interminable at this point. Mom wasn’t getting it. He wasn’t even talking about the keyboard, in his opinion, and still Mom wasn’t mentioning when she would put it in. I poured his coffee and carried it to his room, but he knew that I had not yet plugged in his keyboard. “I can watch a video,” he offered. “Because I’m not gonna mention the keyboard,” he repeated. He stood there waiting……..waiting on Mom who just wasn’t at all thankful for the fact that he wasn’t even talking about the keyboard. Finally, he saw me finishing with the newspaper and straightening up the table. Thinking that I might be headed to take a shower next, he saw another opportunity. “You could put it in before you shower or after you shower, right?” he hopefully asked. I just smiled and went on about my business, but soon I was upstairs retrieving the keyboard from its hiding place, to the great delight of Aaron. I laughed and gave him a hug, and he was very pleased with himself. Oh Aaron, you do have a way of talking something to death even when you’re not talking about it. Imagine if you HAD talked about your keyboard!! Author hesaidwhatksPosted on December 5, 2013 Categories Adult Autism, Asperger's SyndromeLeave a comment on I Won’t Talk About It! Our daylight this morning was muted and as I opened our blinds I could see the reason. Fog. We had the same scene yesterday as well, but I believe this morning’s fog was even thicker than the day before. Opening even more blinds didn’t do much for letting light into our house on this foggy morning. The sun was completely hidden. Something else was hidden too. I noticed it as I stood in Andrea’s room and looked out of her windows. I love the view from this vantage point. I can see our entire back field and then look across the road to the farmer’s field. It’s a view that I’m so accustomed to that I hardly recognize the comfort it gives me until it’s gone……..like it was today. The field, that is. It seemed to be gone. 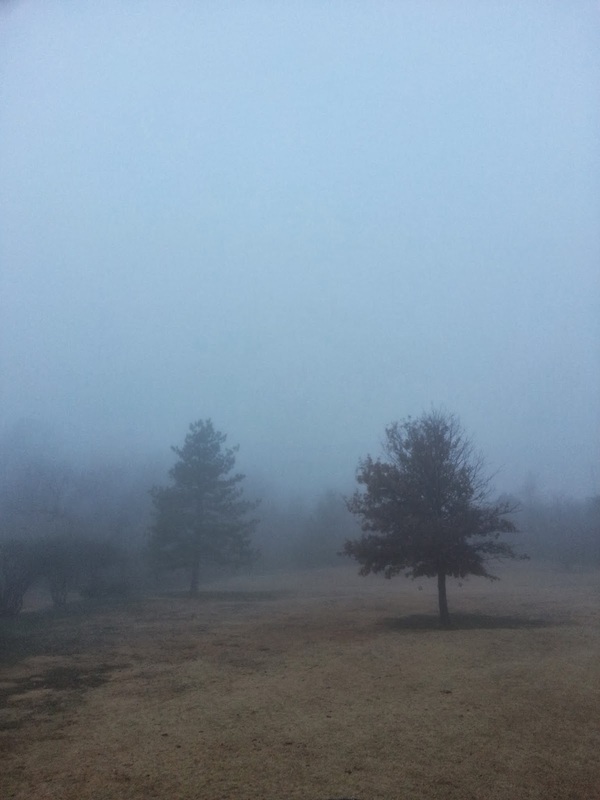 I still had a view of sorts, but my pretty farmer’s field was not to be seen through the thick fog. And I missed it. I felt boxed in……cornered, in a way. 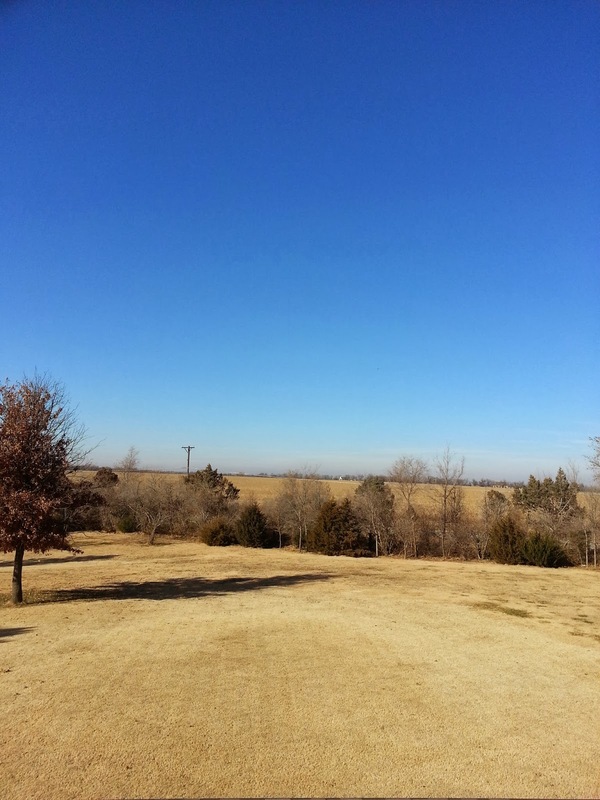 I’ve become used to expansive views living here in flat Kansas, and I love that. I love seeing way out ahead, knowing what’s coming and what’s there just by one look. But today, for the second day, my view was limited and my field was not there…..so it seemed. Oh, I knew the field hadn’t gone anywhere. Fields don’t just up and leave. But I couldn’t prove it was there by what I was seeing at the moment. 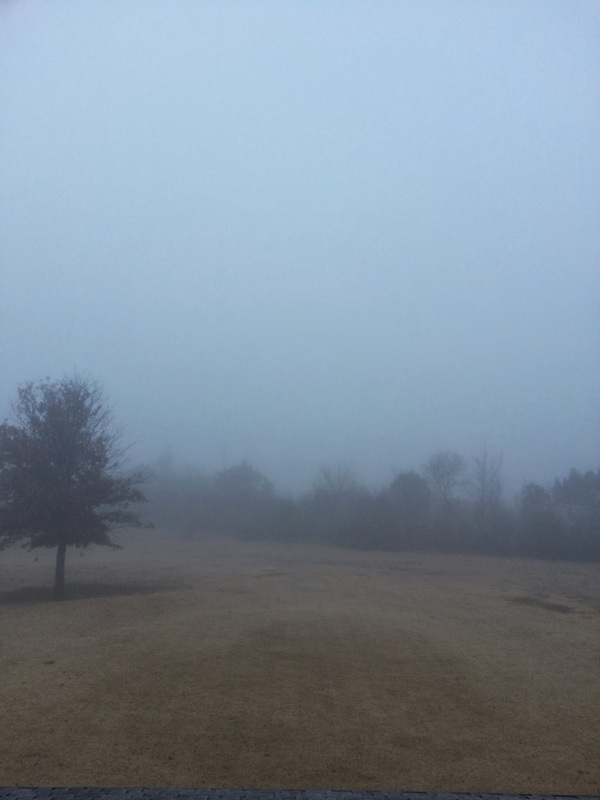 What I was seeing was…….fog. Fog that seemed to be deepening by the minute, which obscured my view even more. By the time I left the house to run my errands a couple hours later, the fog was still hovering low to the ground. And my field was still unseen, at least by me. I was gone longer than I had anticipated today. Christmas shopping, you know. By the time I drove home, the lights on the van were no longer needed. The sun was shining brightly, the sky was blue, the temperature warm………and my view had returned. I walked upstairs and into Andrea’s room to look out the window, and there it was. The field. Of course, I knew it would be there but it sure was nice to see it for myself. 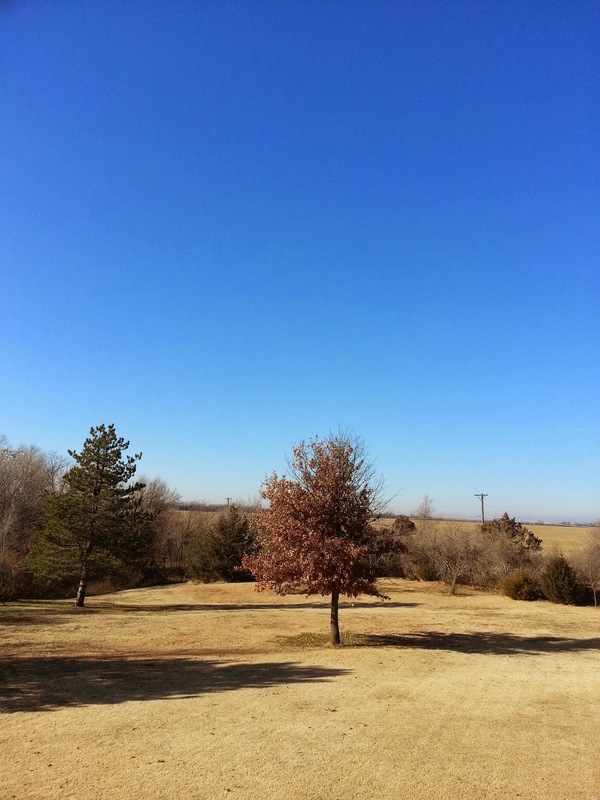 My world looked entirely different in just a few hours…..bright and large and back to normal. I got a lump in my throat this morning as I thought about the fog. It wasn’t that the fog made me want to cry, but what the whole scene represented to me caused my emotion. You see, I’ve had a life that I’ve been used to for a long time. Really, ever since I was a little girl there are aspects of my life that have been pretty much the same. The past few years have changed a lot of things for me, though. Change has come in various ways. Loss of parents. Kids growing up and moving on. Physical changes as I age. Health decisions for Aaron. 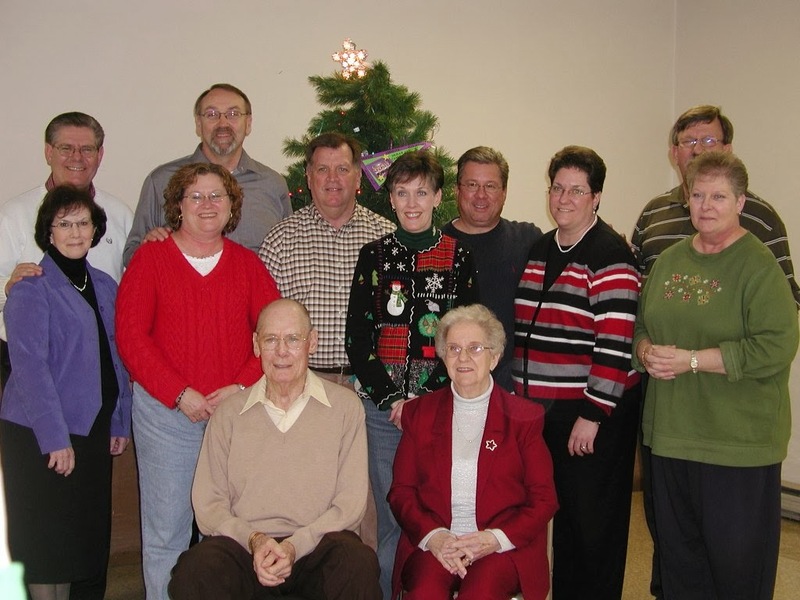 And perhaps most significant of all, for the present, is the loss of a dear ministry that we loved and the fellowship with friends that went with it. It’s put me……..us………in a place we have never been before. Loss and change of this type cause a season of grief and instability. Like having my normal view disrupted by the fog, all this change in my life has been unnerving to me. What I have been accustomed to no longer exists. I look out the windows but I don’t see very far. I can’t tell what’s ahead, not even a little bit. I don’t have instant answers to my questions. And honestly, just like not being able to see the field, I sometimes don’t even see God. Don’t get me wrong. I know God doesn’t just up and leave one of His children. I couldn’t prove the field was there today by what I was seeing……or not seeing……but I knew it was there because I know about fields and I know they don’t vanish. I can’t always prove God is here by what I see or how I feel, but I know God and I know He doesn’t leave me. I know that God has allowed a period of fog in my life, if for no other reason than to teach me to walk by faith and not by sight………and not by emotions…….and not by clinging to that which is comfortable and familiar. Will my world someday be bright and large and back to normal? I have a feeling that my normal will be forever changed. But I do anticipate that God will clear away the fog and that my view will be enlarged. I don’t know how and I don’t know when. But I know God and I know He is with me. He does not hide His face from His children. Through the fog He is there, faithful and steady and sure even when I don’t see Him. I hope I’ve learned through all of this that I can’t trust the view. It’s God Himself that I must trust, even when I don’t see Him. He never just up and leaves.